Colleague Colin A. Hope, PhD, an expert in blue painted pottery, had asked if she wouldn’t help him pin down the source of the blue pigment by sampling and analyzing material from the mine. In the wastes of the eastern Sahara, nestled against the limestone escarpment that separates the desert from the Nile Valley, lies the Dakhleh Oasis. This fortunate spot, where deep water is able to reach the surface along fractures and faults under its own pressure, has been continuously inhabited for a very long time — perhaps as long as 400,000 years. During that period, there were roughly four glacial cycles and, although Egypt itself was ice-free, the local climate oscillated from hyperarid to semi arid as the Earth's orbital position drove changes in the location of the tropical rainfall belts. Smith studies the impact of these climate fluctuations on ancient oasis dwellers. But Smith also is the “generic geologist,” as she puts it, for the Dakhleh Oasis Project, a long-term study of the oasis that covers the entire stretch of Dakhleh history, from the Neolithic through the Pharaonic, Roman, Islamic and modern settlements, and employs — off and on — more than 50 specialists. “The dig house is open from November until March,” Smith says. As generic geologist, Smith was asked to help with a material-sourcing puzzle that she says was “way outside her period.” During the 2007 season, Hope, associate professor and director of the Center for Archaeology and Ancient History at Monash University, asked her whether a mineral found at the oasis could have been used to color the blue painted pottery. It was a small question, but an intriguing one. Most Egyptian pottery is undecorated, but during the New Kingdom, the period when Egypt was at the zenith of its power, a variety of pottery was elegantly decorated in a distinctive pale blue. The pottery has been found at many sites in Egypt and also in the Middle East and in Sudan. The largest deposits, however, were found at New Kingdom sites in Egypt, including Malqata (the palace complex of Amenhotep III), Amarna (the remains of the city built by the Akenaten, the famous pharaoh who moved the capital from Thebes and established his own religion), the cemetery at Deir el-Medineh (the village where artisans who worked on the tombs in the Valley of the Kings during the New Kingdom lived), and the Great Temple of Amun (patron of kingship during the New Kingdom). “Walking over some sites, it is only a matter of minutes before several shards of blue painted pottery or cobalt blue glass or faience can be collected,” Hope, who has written extensively about the pottery, says. Given the restricted use to which the pigment was put and the archeological sites where remnants were found, Hope believes it probably was available only to artisans associated with major royal residences. The pale blue is distinguishable at a glance from the brilliant blues and blue-greens of the faience glazes common from 3,000 BC onward. Faience, probably most familiar in the form of the small statue of a hippo nicknamed William that is now in the collection of the Metropolitan Museum of Art in New York, was made by adding ground copper to ground quartz to create what ceramists today call Egyptian paste. But it is difficult to create durable patterns with copper pigment on pottery, Hope says. "Copper-based pigments must be applied in thick layers and were added after firing, so they tended to flake off when an object was handled. Instead of copper, the colorant used on most of the blue painted pottery is cobalt, which was fired onto the pots. Where did the cobalt-bearing mineral come from? Analysis of the paint showed that the cobalt was accompanied by trace amounts of zinc, nickel and manganese, a mixture of elements distinctive enough to serve as a chemical fingerprint. At the height of its power, the Egyptian administration of the Nile Valley sponsored mineral exploitation of the valley and surrounding desert regions. As early as 1980, it was suggested that the cobalt might have come from the desert oases at Dakhleh and Kharga. In the lower foothills of the oasis escarpment at the western end of Dakhleh, four mine shafts were meticulously hand-cut into the rock. Steps carved along the shafts allowed a safe descent. The shafts provided access to horizontal galleries, some as long as 15 meters, that followed horizontal veins of the mineral alum. A few centimeters thick, the alum veins are fibrous, pale gray to pink in color and slightly astringent. Alum is both the term for a specific compound and for a class of compounds, all of which contain two negatively charged sulfate groups and two chemical elements or groups bearing a positive charge. The specific compound is hydrated aluminum potassium sulfate but many other elements or groups can substitute for the aluminum and potassium, and cobalt is one of these. Alum was probably exploited for a variety of purposes in ancient times, some having nothing to do with color. The Egyptians, for example, used alum both to whiten skins during tanning and to prepare cloth to absorb dye. Alum is still used today in styptic pencils to stem bleeding and in recipes for pickling cucumbers. More recently, it has been in vogue as a "crystal deodorant" that is sold as more natural than older deodorant products. 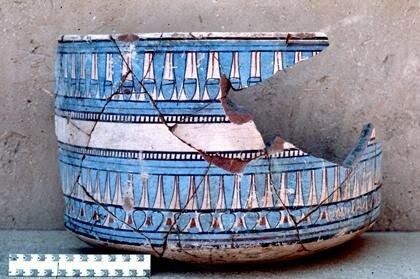 Was the Dakhleh Oasis alum used as a general-purpose astringent, or did it have the same chemical fingerprint as the blue paint on the pottery? To find out, Smith needed to sample the alum and analyze its composition. In the case of the Dakhleh alum, the crystal structure was of little use because it would have been destroyed in preparing the paint. Only the composition could connect the alum to the pottery. Smith’s results showed that the alum did contain cobalt, although they weren’t particularly rich in this element. The cobalt, however, was accompanied by trace amounts of manganese, nickel and zinc, the same mixture of elements found in the blue paint. Surprised by the low concentration of cobalt, Smith wondered if the ancient artisans hadn’t found a way to concentrate it on site. One sample she collected, a crust at the edge of a partially flooded mine shaft, had a higher cobalt content than the others. Because sulphate dissolves easily and the mines were much more likely to have been flooded in the past, she wondered whether the cobalt was mined not by chipping it out of the rock but instead by ladling water out of the mines and collecting the sediment left over when the water evaporated. “But this is wild arm waving given the amount of data,” Smith says. This small exercise in archeological problem-solving left her with a deep respect for the long-vanished miners. “I look at all these different veins of sulfate, and I don’t know which are useful for which purposes without doing analyses, but they must have had ways of telling from observable properties which ones to mine. That’s impressive,” she says.